Model United Nations is a life-changing journey that will help you develop confidence in leading others, a stronger awareness of global issues, and the chance to make new friends from around the world. 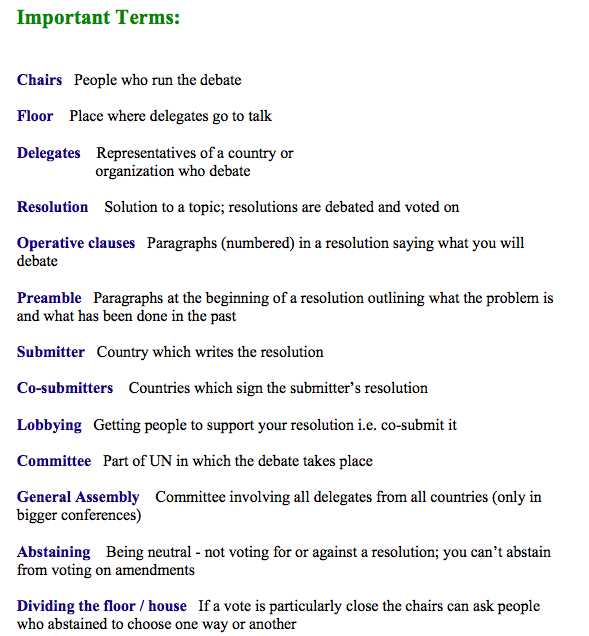 Model UN may seem confusing at first, but there is some help on this page. It’s important to dive right in because Model UN is an activity that can only be learned through participation. Once you have signed up for the conference, you will receive your country assignment, your committee, and its topics. Write a policy statement (position paper), and a clause for each of the topics in your committee. Research papers will be posted soon. The Position Paper is a one or two page document that is essentially a summary of your knowledge of the topic and the position your country plans to take when it enters committee. It typically contains three sections: Background of Topic, Past International Actions, and Country Policy & Possible Solutions. Position Papers are usually due before the conference. The key starting points for researching each section are listed below. 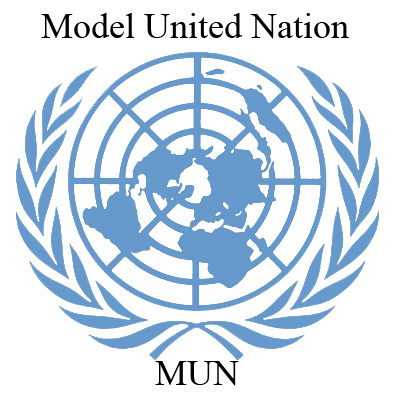 They will help you get started with participating in your first Model UN conference, but you will want to dig deeper as you develop more experience. Country policy and possible solutions: CIA World Factbook, your country’s foreign ministry website, domestic programs within your country, your country’s voting record on key treaties or resolutions, NGO or think tank policy recommendations, and your own creativity! The Opening Speech typically lasts about 1 minute or 1 minute and 30 seconds and is the first speech you give to the committee. It is the best opportunity for you to explain your country policy and the key sub-issues you would like the committee to focus on. Opening Speeches is a main way for countries to determine who they want to work with, so it’s important to prepare a speech that conveys this. There are many tips and strategies on how to deliver an Opening Speech, but use your Position Paper as a guide when you are starting out. The most important action is to just be brave and make your speech. Debate is a form of negotiating in which all parties seek a solution to a problem beneficial to all. All parties should have sufficient background information about the issues discussed in order to quickly respond to questions and comments. A debate is a formal way of discussing. Respect the decisions of the Chair. The decision of the Chair is final. Only the Chair, a member of the house recognized by the Chair for a point, or the speaker holding the floor has a right to speak. The Chair may extend or reduce debate time or speaking time and limit the number of points of information. 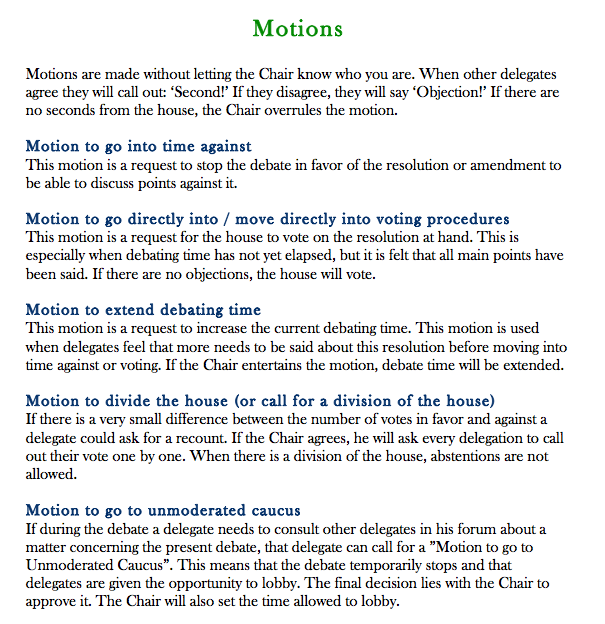 Except by a decision of the Chair, there will be no suspension of the rules or changes in the order of the debate. Insulting or abusive language is not allowed. Operative clauses state the solutions that the sponsors of the resolution proposes to resolve the issues. The operative clauses should address the issues specifically mentioned in the pre-ambulatory clauses above it. Strategy Tip: Usually more details in an operative clause will make it stronger or at least make the idea more clear to other delegates. A simple way to strengthen each operative clause is to answer the “who, what, when, where, why, and how” of each resolution. These details can actually be broken down into sub-operative clauses underneath the main operative clause. 1. A friendly amendment is a change to the clause that all sponsors agree with. After the amendment is signed by all of the clause’s sponsors and approved by the committee chair, it will be automatically incorporated into the resolution. 2. An unfriendly amendment is a change that some or all of the clause’s sponsors do not support and must be voted upon by the committee. This also refers to delegates who did not write this clause at all but see potential in it as long as several changes are made to it. The sponsors of the amendment will need to obtain a required number of signatories in order to introduce it. Prior to voting on the draft resolution, the committee votes on all unfriendly amendments.